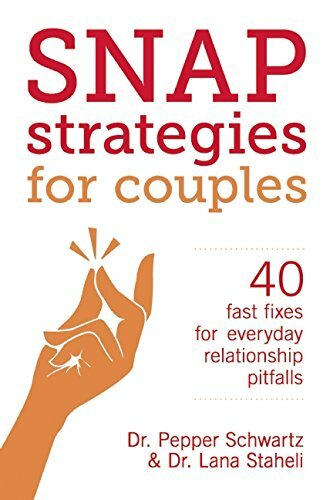 In the next chapter of our new book, Snap Strategies for Couples: 40 Fast Fixes for Everyday Relationship Pitfalls, Dr. Pepper and I warn people not to try and take majority "control" of their relationship without the other partner's say. Enjoy another free sample! You might be able to talk over your partner, wear her down, or talk him into something, but you’ll likely end up losing more than you win. Steamrolling your partner backfires eventually. It is entirely normal to lobby your partner for what you want. In fact, the Gottman Institute’s research found that the ability to influence your partner and the willingness to be influenced is a hallmark of a healthy marriage. Each person has a point of view, a set of beliefs, values, and priorities. Part of being a couple is to add to each other’s lives and perspective. Ideally, we make better decisions and choices together than apart. The cliché that two heads are better than one has merit, and a good discussion is the best way to arrive at more options and better choices. When we have open talks that allow for new ideas, new thoughts, and new learning, we are at our best as a couple. There is a big difference between influence and steamrolling. Influence is the capacity to persuade someone to consider your point of view and perhaps change his or her opinions or behavior through discussion. Usually, viewpoints are shared back and forth and there is no foregone conclusion. Steamrolling is using personal power to metaphorically run over the other person and, like the machine whose name the technique borrows, “flatten” that person and leave him or her without the ability to contradict, argue, or protest. Someone who has been steamrolled has lost the argument, but not with a legitimate exchange of opinions. The steamroller leaves no room for the other person to argue a point or win the exchange. The other person loses the argument but may be seething inside because he or she never had a chance to be heard. They may do what they have to do, but it is because they have to — not because they had a choice. Healthy relationships are based on an exchange of ideas or thoughts. Steamrolling is dominance, eventually creating cycles of rage, agitation, depression, and often the desire to leave. One partner may submit to avoid conflict and aggravation, but if this if the usual pattern on all issues in the relationship, the result is almost always unhappiness. As always, for the other pages of the chapter and the rest of the book, order here!